In a beautiful tribute to five of the coolest birds of prey soaring about the globe, the U.S. Postal Service will release a series of raptor stamps on January 20, 2012. Artist Robert Giusti created the beautiful images that will embolden your letters. All five species - Northern Goshawk, Peregrine Falcon, Golden Eagle, Osprey, and Northern Harrier - can be seen right here in Ohio, and far beyond. I applaud the postal service for promoting birds through this eye-catching collection. Be sure to pick some up. For a bit more on the back story, CLICK HERE. I was pleased to recently receive a raft of wonderful photos, courtesy photographer Chuck Slusarczyk of Cleveland. His stunning images of a Pomarine Jaeger, Stercorarius pomarinus, bear sharing and Chuck was good enough to allow me permission to post them here. A beautiful, fierce subadult Pomarine Jaeger wings by Wendy Park near downtown Cleveland. This bird has been hanging out in this area for a while. In general, jaegers are rare in Ohio and nearly all records come from Lake Erie. 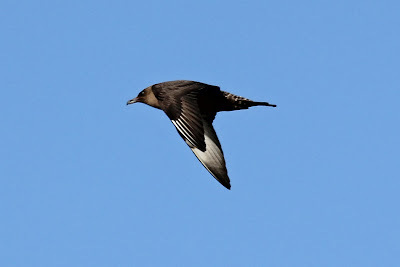 Most birds are in rapid transit in fall and early winter, and probably quickly move west to east down the lake and remain out of sight to land-bound observers. Occasionally a "Pom" finds a desirable locale, and sticks around, like this bird is doing. 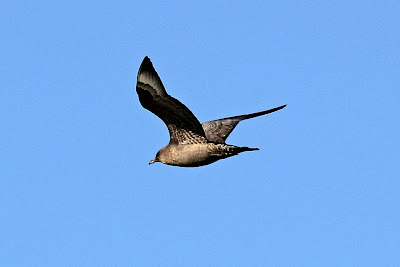 Immature jaegers can be tough to ID, and this is a group where lots of comparative experience with the three species is very helpful (Great and South Polar Skua are also in genus Stercorarius, but they are very different beasts, and strictly marine. About zero chance for either in Ohio). Long-tailed Jaeger, Stercorarius longicaudus, is by far the rarest of the lot in Ohio. Long-taileds are the smallest, lightest and consequently most bouyant of the jaegers. One weighs less than half that of the much sturdier Pomarine. They appear ternlike in flight, especially when compared to the burly purposeful flight of a Pom. 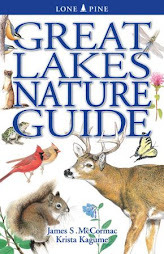 Perhaps one Long-tailed is reported every year or two in Ohio, and they're early birds - usually seen in September or October. SIDEBAR: I've said this before and I'll say it again. One of the great, simple innovations of the landmark 2000 Sibley Guide to Birds is David's inclusion of weight for each species. I suppose other guides omit that vital statistic under the premise that one can't see weight. Not true - the weight of the bird can effect its overall look and flight characteristics, especially in comparison with similar species. Separating Pomarine Jaeger from Parasitic Jaeger, S. parasiticus, is often problematic. The two are fairly close in size, although if we go back to the Sibley weight reports, an average Parasitic weighs about 1/3rd less than a Pomarine. In comparison with the ever present Ring-billed Gull, a Parasitic should appear slightly smaller, while the more massive Pomarine will appear larger. Pomarines also show a nice "double flash" of white at the base of the underside of the primary flight feathers, as Chuck's first photo beautifully illustrates. A Parasitic normally has a single broad band of white. All of the identification issues aside, jaegers are just VERY COOL BIRDS. Jaeger is an English spelling of the German word Jager, which means "hunter". It's an apt moniker for these warlike birds that make their living by pursuing gulls and terns that have caught prey, and harassing them until the legitmate earner of the fish is forced to drop its prey, which is then quickly snatched up by the jaeger. Such bullying behavior is termed kleptoparasitism. No one likes a bully, and the gulls seemingly detest the presence of a jaeger. When a jaeger enters the scene, it often causes an electric ripple of palpable tension among the gulls, who will often rise in mass. Observing a jaeger single out a gull and acrobatically pursue it until the bird disgorges its fish is a thing of beauty, no matter what one thinks of avian bullies. Jaegers nest in the high reaches of the Arctic tundra, and there they subdue their thuggish instincts somewhat and become highly dependent upon a small mammal, the brown lemming. So wedded are breeding Pomarine Jaegers to these furry little sausages that their breeding success correlates closely with lemming population booms and busts. In fact, Poms will actually locate lemming burrows and dig the little beasts out! But once a hood, always a hood, and they also grab eggs and nestling birds. The vast majority of jaegers are pelagic in winter, spending the season far out at sea. 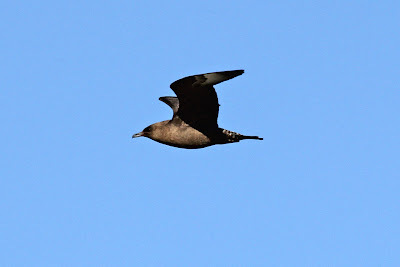 Thus, a wintertime Pomarine Jaeger on Ohio's freshwater "sea", Lake Erie, is always a treat. Thanks to Chuck for sharing his excellent photos. While traipsing through the winter-browned Sandusky Plains prairies today, I crossed the path of some American Tree Sparrows, Spizella arborea. Lucky me, and I had my camera in tow. These jaunty little sparrows rank high among my favorite birds, and I settled in to watch the little flocks as they worked over the seeds of goldenrod, switch grass and other ripenings. I'm usually first alerted to foraging tree sparrows by their thin wispy tseet notes - contact calls by which they talk to each other. Sooner or later, the flock will take wing, blowing low over the ochre prairie like delicate little leaves on the wind. Their sweetly musical flight notes sound like tiny icicles shattering. The tree sparrow and its subtle melodies mesh perfectly with the barren prairies of winter. Should you have an interest, I wrote in more detail about American Tree Sparrows HERE. 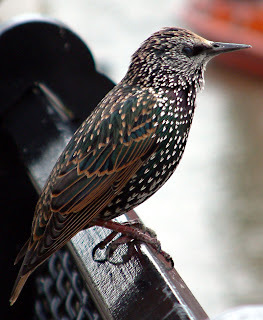 The good ole European Starling, Sturnus vulgaris, in nonbreeding plumage. This species, handsome as it may be, is one of the most reviled of North American birds. In its breeding finery, the European Starling is actually a showy bird. Fronted with a bright lemon-yellow bill, the starling is a study in glossy iridescence, reflecting rich purples and deep greens depending on how the light strikes the bird. 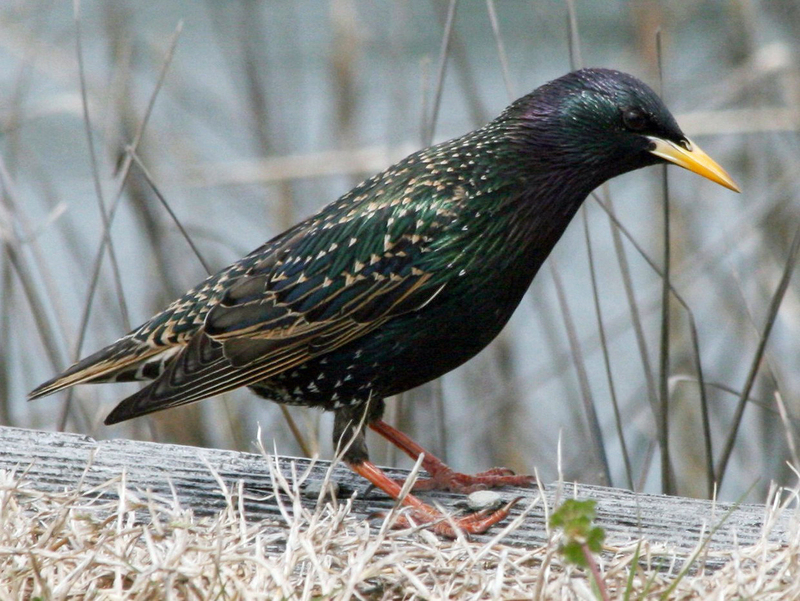 European Starlings, however, have no place in North America. They were intentionally released in the early 1890's in New York City by the ecologically ignorant Shakespearean Society. These avid buffs of all things Bill got it in their minds that all animals mentioned by the legendary bard should be established here, so that these beasts might enrich our lives on a daily basis. Fortunately most of their introduction efforts failed, but the starling was a grand success and is now one of the most common birds in the lower 48 states. Starlings' cavity-nesting habits and aggressive demeanor have allowed them to displace many native hole-dwelling birds. So starlings' reputations have been tarred by the American experience. But there are about 220 species in the family Sturnidae worldwide, and many of them rank high among the most beautiful birds on the planet. I was recently birding with Bernie Master, who had just returned from an Africa trip, and we got on the subject of starlings. Bernie had made some great photographs of some of the showier species, and allowed me to share some with you. I lifted a few other beauties from Wiki Commons to further illustrate the gorgeous diversity of the starling family. 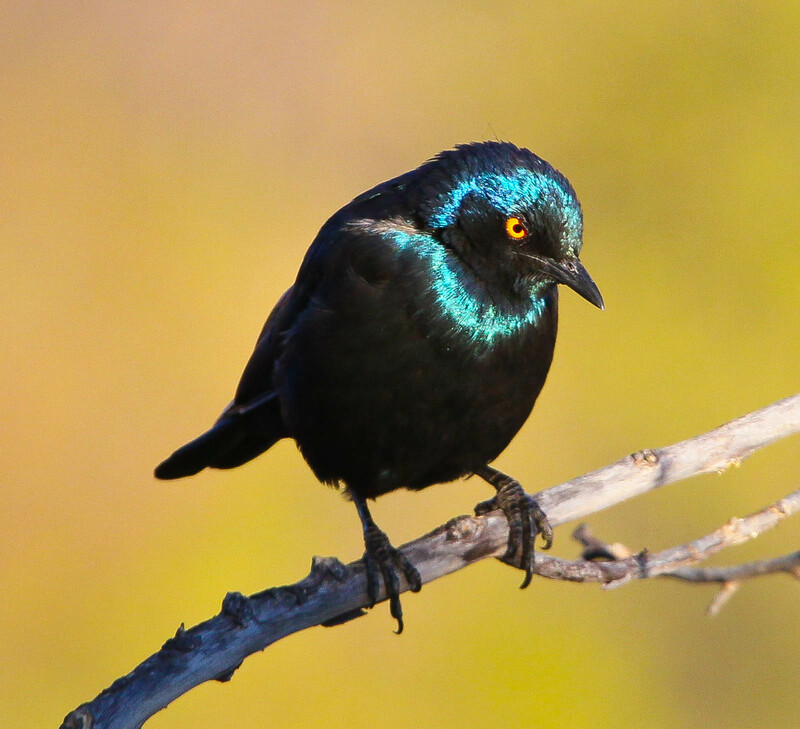 Cape Glossy Starling, Lamprotornis nitens. The specific epithet nitens means shining. Found throughout much of southern Africa. 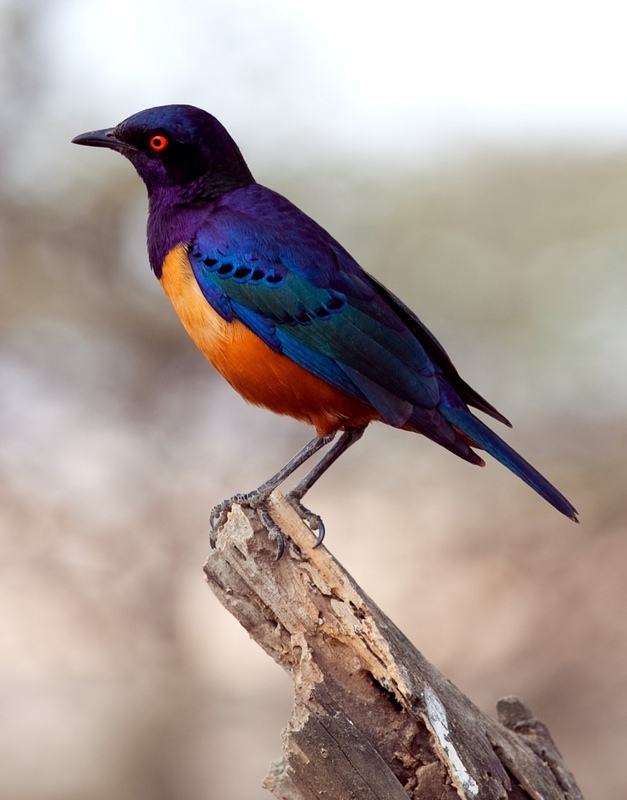 Hildebrandt's Starling, Lamprotornis hildebrandti. Found in Kenya and Tanzania. 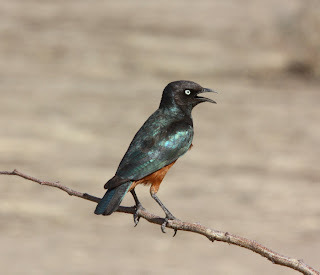 Chestnut-bellied Starling, Lamprotornis pulcher. Ranges throughout much of northern Africa. 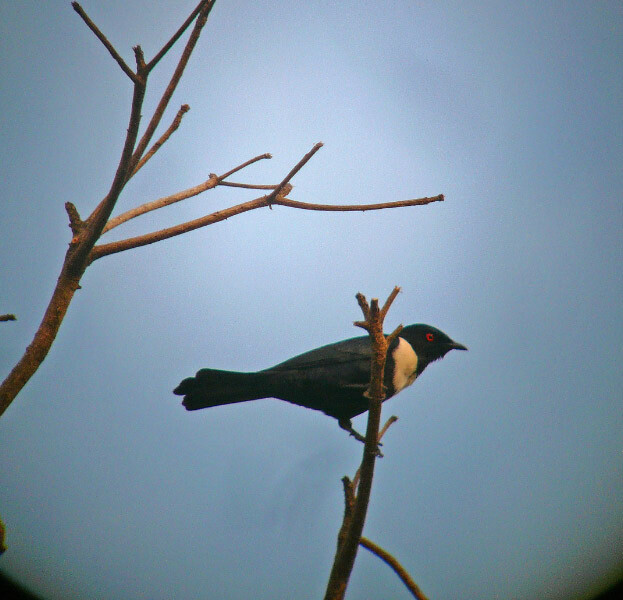 White-collared Starling, Grafisia torquata. Found throughout much of western and central Africa. Superb Starling, Lamprotornis superbus. Ranges throughout much of eastern Africa. The animal is indeed superb in appearance. Meve's Glossy-Starling, Lamprotornis mevesii. Found throughout much of South Africa. 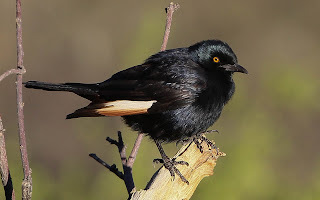 Pale-winged Starling, Onychognathus nabouroup, another South African species. 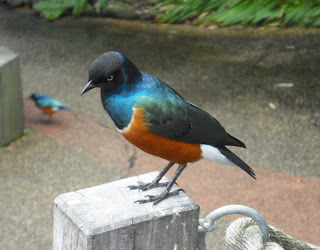 There are many other beautiful starlings in the world, from Eurasia to Australia to remote Pacific islands. The family also includes the Mynas of eastern Asia. A gathering of starlings is termed a mumuration. A large murmuration of European Starlings can be a beautiful thing, the swirling cloudlike flocks moving as one, as if a collective brain controls the entire group. CLICK HERE for an utterly amazing murmuration experience. Last Sunday, Bernie Master and I were patrolling the expansive Green Lawn Cemetery on the south side of Columbus, Ohio, tallying birds for the local Christmas Bird Count. Suddenly a bonus trotted into view - these three buck white-tailed deer, Odocoileus virginianus. They were accompanied by five anterless deer, does apparently. These two were the studs, without doubt. Anytime the antlers (rack) flares outward beyond the ears, the animal will look impressive. By my reckoning, both of these beasts are 10-point deer. 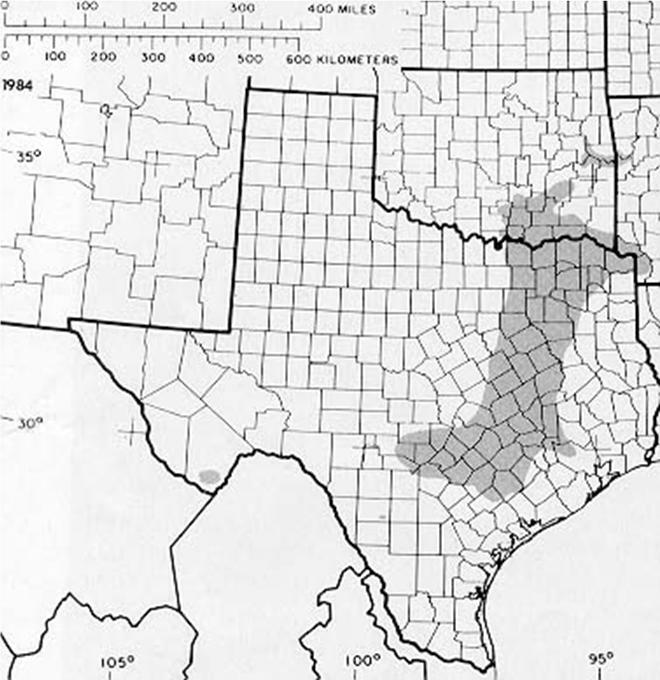 The terminus of each antler branch, or tine, counts as a point and in the eastern U.S. the custom is to add all of the points up for the point score. In the west, they typically count only one side, so on the other side of the Mississippi these would be five-pointers. Eight of the points are obvious (the small central brow tines count). Look closely and you'll see a small spur tine on the forward right beam of the deer on the left side of the photo. Both of the big bucks had these small spurs on both of their beams, and by Boone & Crocket rules a tine must be at least one inch to qualify as a point. By my eyeball reckoning, they were, thus the animals are ten-pointers. A big white-tail buck can go 250 pounds or more, and I'd say these two were in that range. You can see a lesser male in the backdrop, peeking between the studs. I'm sure many a hunter would dearly love to harvest one of these animals, but these deer are completely off limits within the confines of the 360-acre cemetery. Looks can be deceiving. This trash-strewn Jackson County, Ohio gorge is actually a beautiful place, and would look nearly pristine were it not for the cascade of old appliances, bottles, mattresses, fast food containers and various and sundry other junk. It never fails to amaze me how people can so thoughtlessly abuse their own environment. But this is an all too common garbage disposal technique in southern Ohio - cast the rubbish down the steepest slope around. We - Nina, Heather, and I - were standing roadside here last Saturday, doing our best to pick up the nasal tinhorn trumpets of a Red-breasted Nuthatch. We were tallying avifauna for the Beaver Christmas Bird Count, and our mission was to find as many birds as possible, and the little nuthatch had thus far eluded us. Across the steep-sided ravine was a wall of stately Eastern hemlock trees, their lacey evergreen boughs providing a jarring contrast to the avalanche of litter on our slope. Suddenly, sharp-eyed Nina announced a nice find, but not of the feathered kind. She had spotted a small colony of one of our most interesting orchids, the puttyroot, Aplectrum hyemale, far down the hill. This find is proof that binoculars come in quite handy when botanizing, as our optics allowed for good views and confirmation of the identity. Distant views through the bins simply was not good enough, and we slip-slidingly wallowed our way down the treacherous slope. Not only was there jaggedly dangerous rubbish to contend with, but damp leaves cast over muddy ground on a 1 to 1 grade makes for tough hiking. But we eventually arrived at the orchid patch, and I was able to make some photos. Here we see the distinctive overwintering oval-shaped puttyroot leaves. They are blue-green and thinly pin-striped, like the fabric of some fashion-challenged pimp's zoot suit. The color and pattern look quite nice on these leaves, though. As is so often the case with flora and fauna, the scientific name is instructive: Aplectrum = "without spur", which refers to the flowers' anatomy. The specific epithet hyemale is more telling - it means "of winter". Puttyroot - and its ally the cranefly orchid, Tipularia discolor - are unusual in that they are more easily found in the dead of winter. Their leaves push from the rich humus of mature forests in fall, and persist throughout the winter, doing their photosynthetic magic and pumping sugars to the underground parts. Here is the source of the orchid's common name. The tuberous root does indeed resemble a glob of putty. Within this subterranean structure all manner of orchidological magic is taking place, even when northern plant enthusiasts' minds are far from flowering plants, let alone tropical orchids. Throughout our coldest snowiest months, the puttyroot leaf is capturing the feeble short-lived rays of the winter sun, and building up steam for next spring's botanical eruption. We of course replanted this specimen back in its niche after taking photos. Voila! 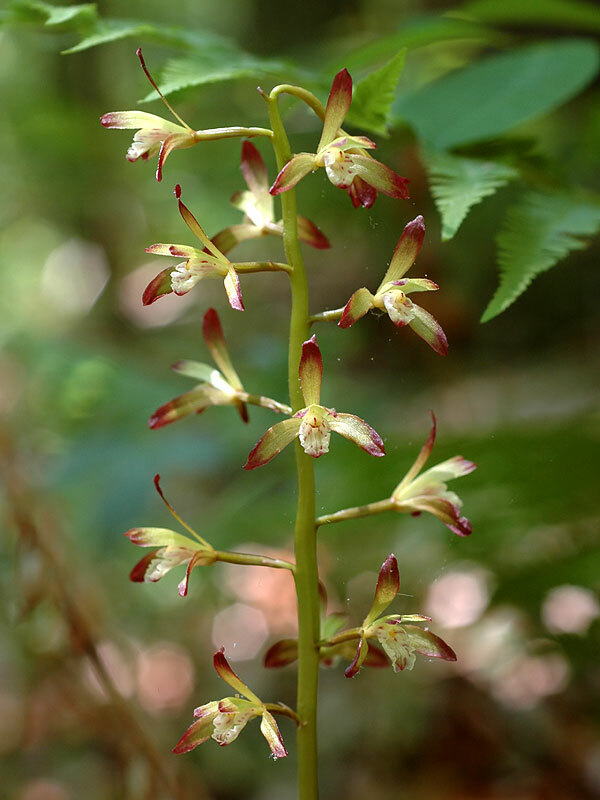 Come mid-May, after the pinstriped leaves have largely withered to nothingness, the puttyroot sends forth a beautiful spire of delicate orchid blooms. Their flowering takes place in a very different landscape than the winter scene in which the leaves are found. Nina's plants, when they blossom, will be serenaded by Louisiana Waterthrush, Hooded and Worm-eating warblers, Scarlet Tanagers, and myriad other songbirds. The orchids will add their radiance to a sea of showy spring wildflowers such as toothworts, large-flowered trillium, and wild blue phlox. That's Nina on the left and Heather on the right, deep within the puttyroot gorge. As we inspected the area, we were delighted to notice many of the massive leaves of the very rare umbrella magnolia, Magnolia tripetala, littering the forest floor. This exotic treelet is at its extreme northern limits here, and is listed as threatened in Ohio. We probably would not have noticed the magnolias had not the orchids' allure enticed us down the slope. A female Merlin, Falco columbarius, sits high atop a dead snag in Green Lawn Cemetery on Columbus, Ohio's south side. Bernie Master and I were canvassing the cemetery yesterday, doing our part to tally birds for the Columbus Christmas Bird Count. This is now the 5th or 6th winter in a row that Merlins have returned to Green Lawn. They're generally a snap to find; just patrol the area immediately south of the bridge towards the cemetery's southwest corner, and you should spot one or more of the birds teed up on the most prominent dead snags. I glanced over at another, more distant snag and there was yet another Merlin, an adult male, or tiercel. And then, wham! An immature tiercel (falcon-speak for males) shot in like a cannonball and mixed it up a bit with the other male. So, three different Merlins were all in sight simultaneously - the largest number of birds that I have yet seen at Green Lawn. One must wonder if this is a family unit, and if so, where they nested. I believe it is just a matter of time before this species is found nesting in the cemetery. One of the males speeds off, looking rather nighthawkesque. 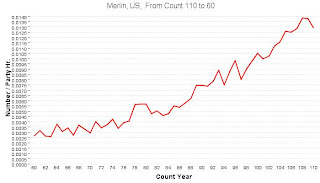 Merlins are the ultimate "bird hawks", flying down and whacking songbirds with ease. You would not want to be a cardinal or junco and find yourself in the sights of one of these sleek avian missiles. 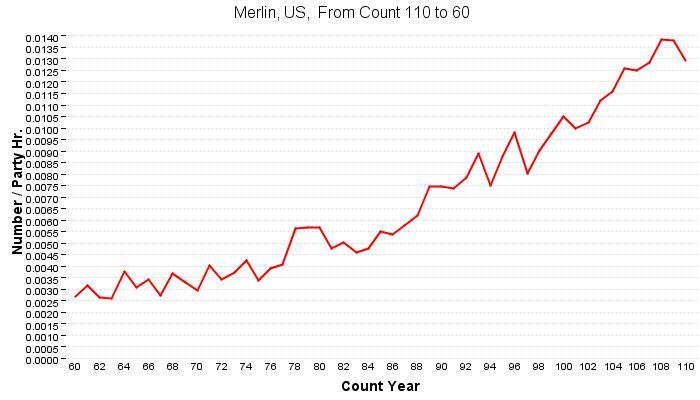 I find the personalities of Merlins interesting and charismatic. The adult female will sit like a queen atop her snag, seemingly looking with great disdain at all that is beneath her. You can walk right under the tree, and she'll scarcely even bother to cast a glance your way. Mere ground-bound humans are not worth the bother of of even a sideways look. At one point, one of the males returned from a foray, and couldn't resist roaring in low over the perched female, nearly whacking her in the head. She didn't even flinch, or even acknowledge his presence. Total cool. Courtesy of the National Audubon Society's immense treasure trove of over a century's worth of Christmas Bird Count data, I was able to assemble some instructive charts. 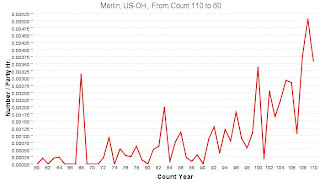 The one above depicts the last 50 years of CBC data for Merlin from the entire U.S. A steady upwards climb - Merlins are doing well, and we see this success reflected in the number of birds that are reported each year in Ohio. 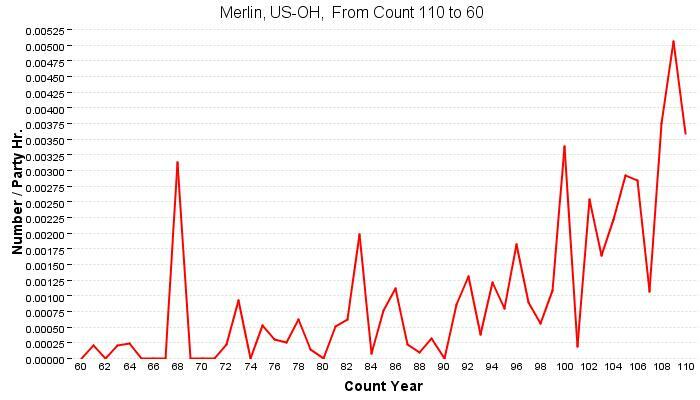 Here's the last 50 years of CBC data of Merlin in Ohio. Some prominent peaks and valleys, but a steady and rather dramatic upwards surge. It'll be interesting to see how many are found on statewide CBC's this winter. Bernie and I were quite pleased to find this stunning male American Kestrel, Falco sparverius, mousing in a large open field near the new police impoundment lot on the south side. These little falcons are increasingly hard to find, especially in the Columbus area, where development has eaten up much of the kestrel-friendly countryside. In short order, the male's mate appeared and joined him in hunting. Hopefully this is a local pair and is nesting nearby. 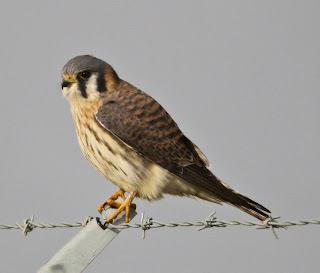 We found another Merlin not far from where these kestrels were hunting, for a total of four. 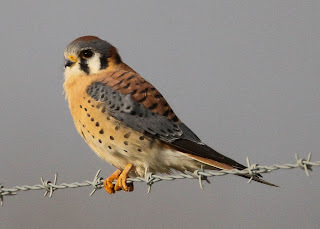 And only two American Kestrels. Until very recently, I would never have predicted that the day would come when it would be easier to find Merlins than it would American Kestrels on this CBC. 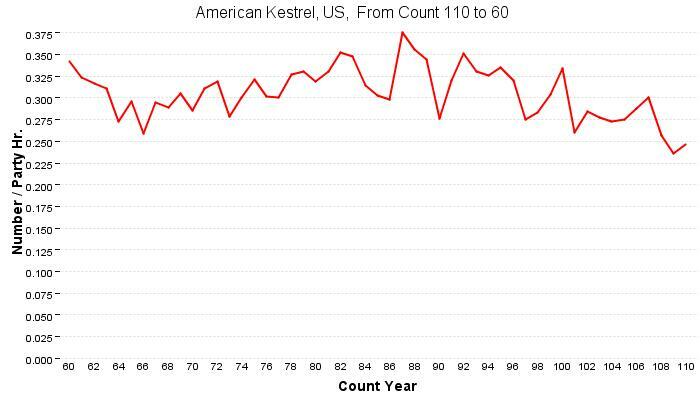 American Kestrels are not doing well. This chart shows the 50-year trend from CBC's nationwide. 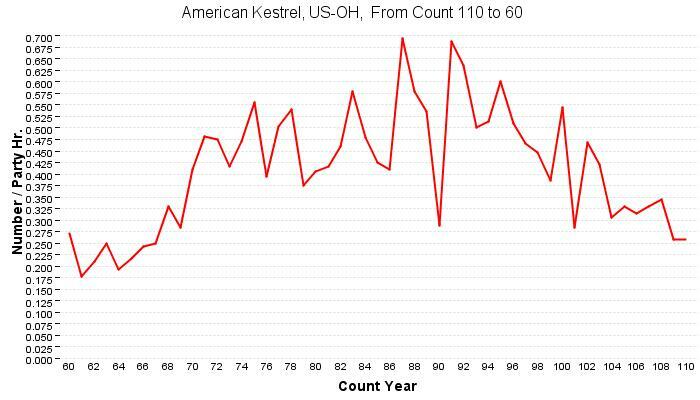 Here's the graph of the last 50 years of kestrel numbers from all Ohio CBC's. Again, not encouraging. 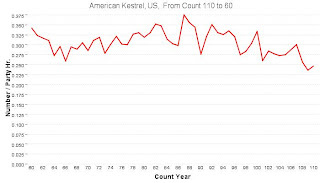 The counts at the beginning of the graph, which date to the early 1960's, are about the same as recent years. The early data may reflect a lack of birder coverage, though - there were fewer counts and fewer people out conducting counts back then. 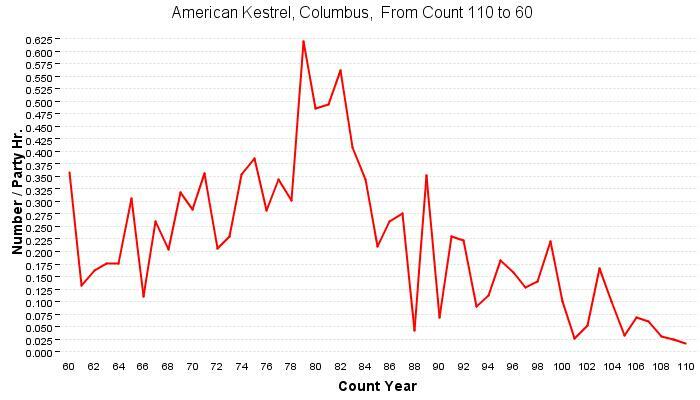 Last year, a total of 819 kestrels were reported from all Ohio CBC's. The annual average over the last decade was 963 birds. The annual average of the decade prior to that - 1991 - 2001 - was 1,342 kestrels, or 40% more birds than were reported on last year's CBC's. 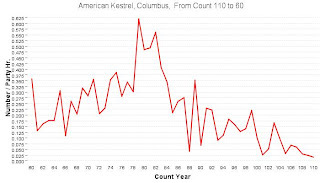 This graph depicts the last 50 years of kestrel CBC data from the Columbus count. A real nosedive here, and not surprising given how much of the open meadow and field habitat has been lost in this area. 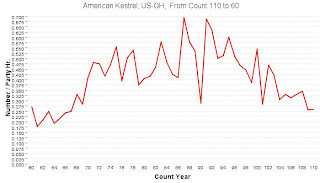 Habitat loss, in tandem with much "cleaner" agricultural practices are certainly one of the great factors that is adversely impacting kestrels. Some people think that the boom in Cooper's Hawks is also an issue, as these accipiters will prey on kestrels. Another pinch point for kestrels is the availability of suitable nest holes. They're cavity nesters, and in general good holes are probably becoming harder to find and the competition for them from other cavity-nesters is fierce. At the conclusion of a long day of birding in the remote hills of northern Jackson County yesterday, Heather, Nina and I found ourselves heading back north on route 35, not far south of the Ross County line. As twilight's gloom settled in, we glanced up to a distant ridge and saw some American Crows. Well, not just "some". Oodles, actually. "Stop! Turn around"! shouted your blogger, and we soon jagged off the highway onto a rural lane, and motored to a spot that offered a commanding view of the spectacle. Crows have long had a big roost in this area. We were down there to participated in the Beaver Christmas Bird Count, and I've done nearly every count since its inception many years ago. On my yearly crack of dawn drives, I'd often see massive numbers of crows radiating out from their hilltop roosts on the high ridges just southeast of Chillicothe. This year, they've apparently relocated the party several miles to the south, and in our count circle. So, Nina, Heather and I watched the day's closure along with an estimated 6,000 crows, although we weren't nearly as loud. Here's a brief video of a small portion of the roost. It can be really hard to pinpoint exact numbers of birds in roosts such as this, but 6,000 was our best shot and it may well be low. The din created by this pack of birds was impressive. Seemingly every one of them had a report to give on the day's activities, and the birds even drowned out the drone of the eighteen-wheelers passing by on the interstate. Crows are highly social, and large winter roosts are a regular occurrence. Although 6,000 birds seems like a lot, it pales in comparison to some of the larger Ohio roosts. Long-lasting roosts in Springfield, Cambridge, and other Ohio locales have hosted 25,000 or more crows. I imagine the spectacle of thousands of loudly cackling, cawing crows streaming in and bedecking the trees is a bit unnerving to some of the citizenry. To me, the birds are totally impressive and a thing of beauty. And just to be clear, a "murder" of crows is just an odd term for an assemblage of these wily mischief-makers. Today was the always interesting Beaver Christmas Bird Count, which covers a very rural section of Jackson County in southeastern Ohio. I've been covering the same tract within this count for a decade or more, and today I had the good fortune of having Nina Harfmann and Heather Aubke along. We had a blast, saw lots of birds, and even some noteworthy plants. More on those later, perhaps. At one point, Heather spotted a small raptor winging over a gap in the forest. We quickly glanced up to see a gorgeous adult Sharp-shinned Hawk, Accipiter striatus, tracing rapid circles. Note I did not say "languid" circles, as I might if the bird were a buteo such as a Red-shouldered Hawk. There is nothing even remotely languid about one of these little death-dealers. This bird was almost certainly a male, as it was tiny. I managed to lunge skyward with the camera and manage this one OK shot. 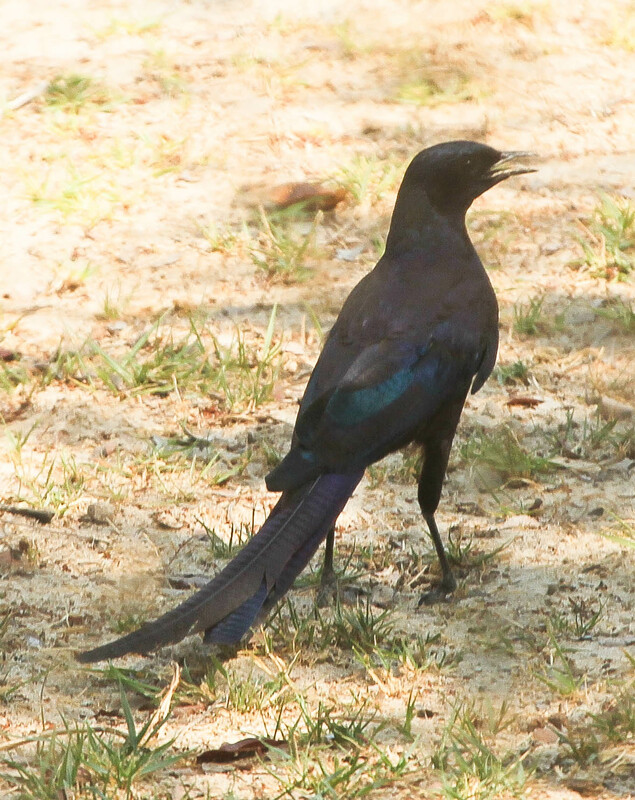 Note the bird's nicely squared off tail. In life, much more was evident that painted the raptor as a "sharpie": tiny size, rapid, almost frantic wingbeats, elfin head and bill. I was delighted by this find, as sharpies are easy to miss. And although I think that the 112 years of Christmas Bird Count data is a veritable goldmine of avian information, and much of it is of great use, I am very distrustful of Sharp-shinned Hawk records. Many of them, I am confident, are misidentified Cooper's Hawks. And to a lesser extent, Cooper's Hawks which are actually sharpies. Anyway, Sharp-shinned Hawks are 220 pounds of Mike Tyson at his prime packaged in Tiny Tim's frame. They're psychotic bundles of testosterone; full of vim and vinegar. No songbird is safe around one. The sharpie is without doubt one of my favorite birds, and it was a pleasure to see one today. I'm too tired this evening to write more, but HERE IS A LINK to a previous posting about these little toughs. I was delighted to pick up my new issue of Winging It today, and see an article by Ohio's own Ashli Gorbet plastered across the front page. Winging It is the newsletter - "official!" - of the American Birding Association and as such, is probably the largest circulation birding info-sheet in the Americas. Ashli, who was hatched in Westlake, Ohio, now hails from Albuquerque, New Mexico where she is secretary of the New Mexico Ornithological Society and works with the Rio Grande Bird Research, Inc. She's smitten with the tropics, and her Winging It article was all about birding in the tiny country of Belize, the northernmost Central American country. Belize is little more than 1/5th the size of Ohio, and its population is only 1/3rd that of my city, Columbus - about 330,000 people, the lowest population density of any Central American country. A visit to Belize is high on my list, and I hope to finally make it there next year. Ashli's article mentioned some of the fabulous birds that can be found in exotic Belizean haunts, such as White-collared Manakin, Black-headed Trogon, and Keel-billed Toucan. Those birds are old friends from other tropical excursions, but I'd like to see them again, in addition to other possibilities that I haven't seen. One of the species that Ashli mentions is this splendid glittering chunk of a beast, the Ocellated Turkey, Meleagris ocellata. I took this photo in 2010, in the country just to Belize's south, Guatemala. This is the other turkey; one of only two species in the genus Meleagris. Its sibling species is, of course, the Wild Turkey, M. gallopavo, which is so familiar to North American gringos. Ocellated Turkeys have a far more limited distribution, being found only on Mexico's Yucatan Peninsula and its immediate environs. Here is a short video of a tom Ocellated Turkey "singing" as it pulls out all the stops to impress the hens at Tikal in Guatemala. It impressed your blogger. 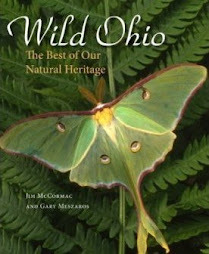 In addition to Belize, another Central American trip you may find of interest is the Ohio Ornithological Society's upcoming expedition to Guatemala, March 4th thru 13th, 2012. You'll see the gaudy Ocellated Turkey and much more. All of the details are RIGHT HERE. Congrats to Ashli on a fine article, and I'm sure I'm not the only one she's inspired to jet south to Belize. I have known this gnarled line of sentinels ever since I was a little kid, and old enough to range a mile away from the familial homestead. They're osage-orange trees, Maclura pomifera, and to me they exude a certain twisted charm. When I was just a lad, these trees stood tall, buffering one of Worthington, Ohio's main arteries. I've always harbored a niggling fear that the neighboring office complex maintenance staff would one day hack them down, disgusted with the trees' annual dump of large pulpy fruit. But apparently others in the area have succumbed to the charm of the "hedge-apple", and so they remain. As osage-orange trees go, these are titans. The state champ - biggest known specimen in Ohio - is a Coshocton County resident, and it stretches 60 feet skyward. These trees aren't all that far behind. Our line of trees was planted many decades ago, back when neighboring Wilson Bridge Road was just a rural lane. Now, the amoebic ever-expanding suburban sprawl has long eaten the farm fields that these windbreak trees once sheltered. Many of my boyhood wildlands have been consumed by pavement, homes, offices, and box stores, but somehow these tough-wooded trees have survived the axe. The brains of the tree - in botanicospeak, an aggregation of fleshy drupes. We'll call it a fruit :-) These hedge-apples resemble the lobes of a brain, with the tightly packed drupes forming a random squiggly mass. One of these things weighs a lot, too, and I can tell you that osage-orange fruit make formidable projectiles when opposing gangs of young boys dispatch them against the opposition. For the most part, animals shun the pulpy hedge-apples, probably in part because they are well-saturated with a foul whitish latex somewhat like the goo found in milkweed plants. But some animals go for them. When I wheeled into the neighboring office complex's back lot, which was strewn with fruit, I surprised two gray squirrels which were industriously tearing the hedge-apples apart. Apparently squirrels find it worth their while to do battle with the gummy pulp in order to get at the (presumably) tasty seeds buried within. Thus, squirrels may be agents of dispersal for this tree, but they probably aren't the animals that co-evolved with osage-oranges and once acted as the prime transporter of its seeds. 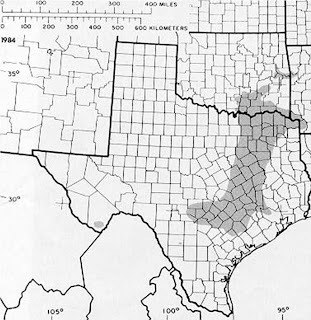 This is the boot-shaped native range of osage-orange - just a limited portion of Texas, and a wee nip of Arkansas and Oklahoma. All the trees that one sees out of this area were brought there by people. A theory has it that now extinct large mammals, possibly giant ground sloths and other large Pleistocene mammals, were the primary consumers of osage-orange fruit. These animals went extinct not long after the first humans colonized North America, and thus the tree's spread was sharply arrested. That's a cool hypothesis. One animal that still does use the tree heavily are Loggerhead Shrikes. Ones study of nesting shrikes not far from the native range of osage-orange found that nearly 70% of the 57 located nests were nestled within the dense gnarly boughs of Maclura pomifera. Such a tree is an Eden for the "butcherbird". The thick branching provides wonderful cover and support, and the thorny twigs offer plenty of spears on which these feathered impalers can skewer their victims. As reported here on December 8th, this Ovenbird, a Neotropical migrant warbler, was found at Inniswood Metro Gardens on December 7th by Jen Snyder and Jennifer Kleinrichert. 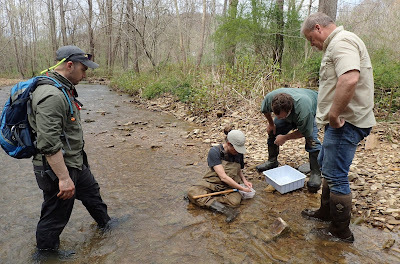 As I am especially interested in warblers and their ways, I resolved to go visit the animal if it stuck around long enough for me to work it in. Jennifer has been great about providing status updates on the Ovenbird, as it does not seem to have a Facebook page. As she reported that the warbler was still present yesterday, it was off to the gardens for me bright and early this morning. And a frosty morning it was, with rime glazing the earth's crust and temperatures hovering around the 21 degree mark. The beautiful Innis House, located smack in the middle of this botanically diverse 123 acre metropark. Over 2,000 plant species can be found; an interesting palette of nonnative ornamentals mixed with native flora and habitats. Our destination? The backyard of this dwelling, which is to your left. A battery of feeders lures an excellent range of songbirds and others, and the backyard overlooks a well-wooded ravine carpeted in mature white oak and other native trees. An ideal setup for attracting birds, and a likely spot to host a rarity. We didn't have to wait but a few minutes, and out sashayed the chilly little Ovenbird, waltzing from the cover of a yew as if it were a fine spring morning. In this photo, the animal has assumed its typical tail-cocked look. I did notice that every now and again, the Ovenbird would tuck one or the other of its legs up, no doubt in an attempt to warm its appendages. The bird feeds on seed cast to the deck from other feeder visitors, and also spends time scratching in the leaf litter under nearby shrubbery. Ovenbirds are habitual ground feeders that pick through leaves seeking various small arthropods, and cold as it is, the hard-working Ovenbird no doubt is able to find some spiders and other tiny animals. We observed a wound or injury of some sort - not too surprising, as one would not think a healthy, highly migratory Ovenbird would remain into a cold, tough Ohio winter. Although the bird can fly, and I couldn't detect any handicaps, it has suffered some sort of apparent trauma to its left flank. That blackened patch below its wing that is evident in this photo may be the result of an encounter with a raptor, an injury suffered from a building strike, or who knows what. Whatever its cause, I suspect our Inniswood Ovenbird has health issues that are preventing it from making the long journey to its tropical wintering grounds. At least a few Ovenbirds have been known to survive the entirety of an Ohio winter, and I hope this bird does too. 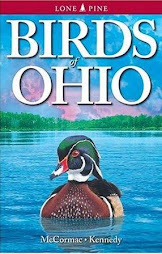 Thanks to Jennifer Kleinrichert for keeping us current with its status via the Ohio Birds listserv. Rufous Hummingbird in Central Ohio!